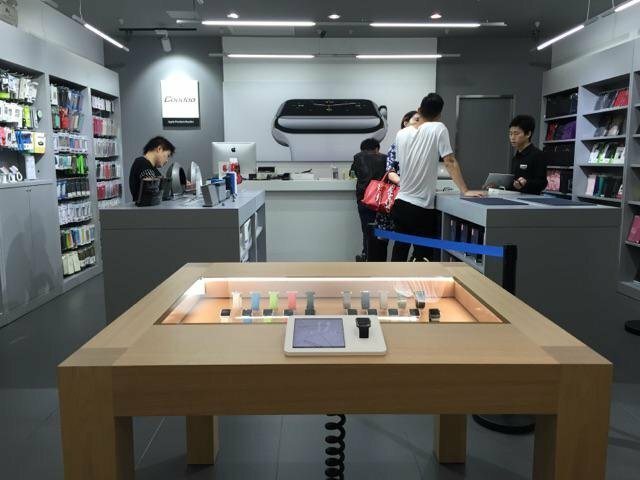 With a relative dearth of Apple Stores in mainland China, Apple has tapped its network of premium resellers to display— and possibly sell— the Apple Watch in the run-up to its debut. A pint-sized version of the wood-and-glass display tables found in Apple's own retail stores, complete with a single hands-on demo unit, was spotted in a Coodoo store in Xiamen, China by photographer David Hobby. Coodoo is a Chinese electronics retail chain licensed as an Apple premium reseller. It remains unknown whether resellers like Coodoo will be able to sell Apple Watches in-store, or if staff are equipped to handle Apple Watch try-ons. AppleInsider was unable to reach a Coodoo outlet before the close of business. There are currently fewer than 20 official Apple Stores in mainland China, spread throughout 10 cities. Apple is in the midst of a major retail expansion that will see it double the number of first-party retail locations by 2017, but even that will represent a relatively barren footprint— there are nearly 100 Chinese cities with over 1 million residents. As a result, the company relies heavily on authorized resellers and wireless carriers to increase its points of purchase in China. Apple chief Tim Cook has called closing this gap a major priority in the company's growth plan for the region.